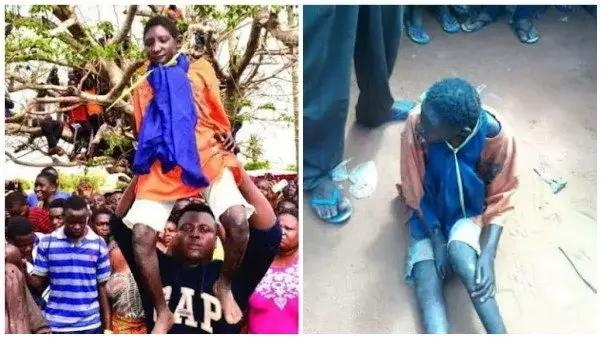 Check out more photos of a bizarre creature which has been feasting on the intestines of humans and animals in Volta region of Ghana. 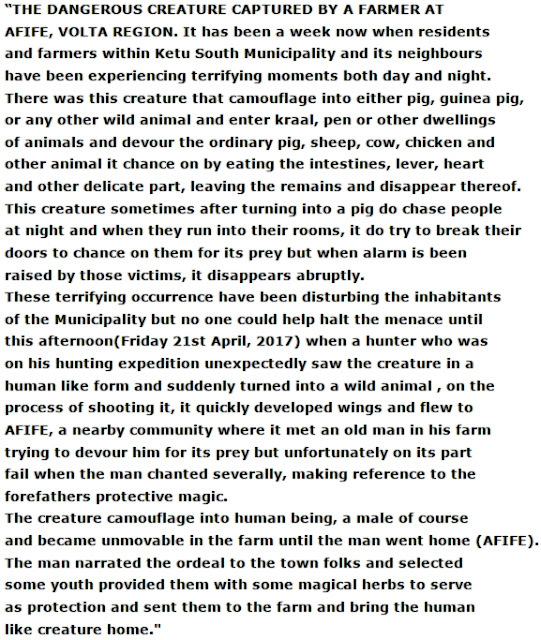 The monster who often changes into pigs and many other terrible animals to terrorise residents of the Volta region of Ghana was caught a week after it was first sighted by concerned residents. It became powerless after an hunter saw the creature in a human form. In the process of shooting it, it developed wings and flew to Afife community where it met an old man on his farm. In the process of trying to devour the old man, the man reportedly chanted some powerful incantations which made the creature unmovable. The man quickly went to his home in Afife where he gathered youths and provided them with magical herbs to serve as protection. He sent them to the farm where they brought the human-like creature home. 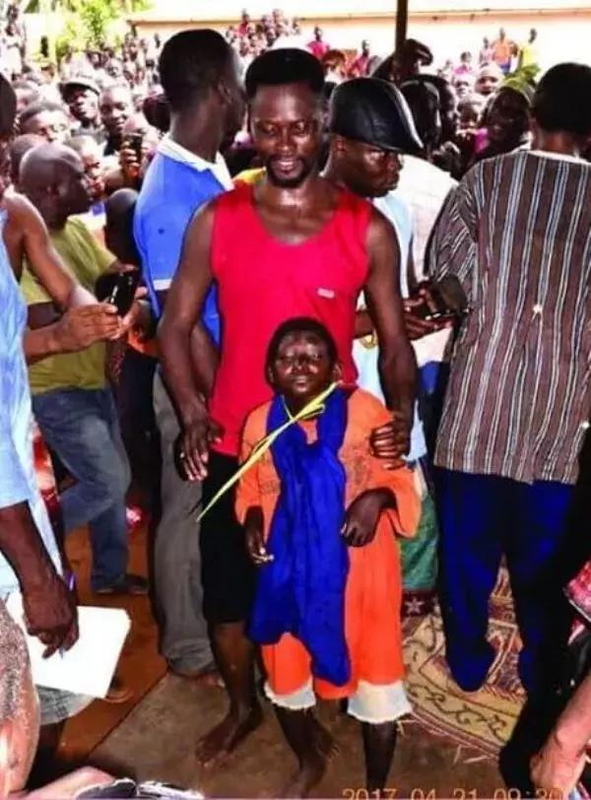 The powerless creature was later taken to a government office in Denu Tokor, Ketu South Municipality of Ghana. Just looks like a scared little boy to me? Why no pictures or videos of the shape shifting? Africans are something else! Forever believing myths and preying on gullible and weak individuals who can’t defend themselves, accusing them of witchcraft and all sorts. 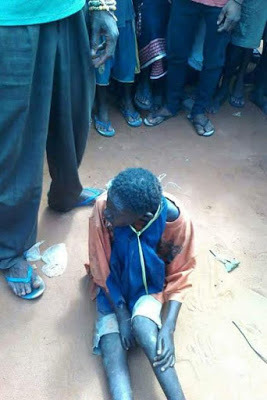 This is just a poor boy, most likely scavenging for food and through some rumour is labeled as a shape shifting creature! 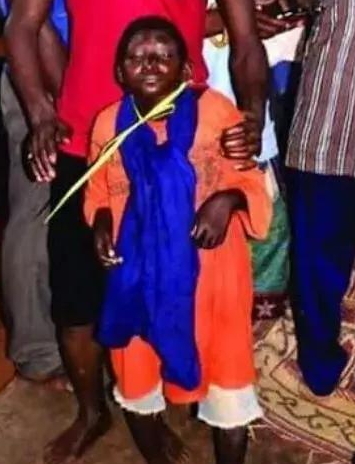 I just hope they don’t waste the poor boy’s life – savages. The story itself doesn’t add up let alone there being no evidence of any shape shifting.